A few weeks ago, our laboratory published a paper in PeerJ (an open-access journal) titled “Vertical heterogeneity in predation pressure in a temperate forest canopy“. This work resulted from a project by former Master’s student Kathleen Aikens. She graduated a little while ago, and although we published one of her thesis chapters in 2012, it took another year to get this paper out, in part because Kathleen and I both become too busy. Thankfully, post-doc Dr. Laura Timms agreed to help us finish up the paper, and she worked with me and Kathleen to re-analyze the data, re-write some sections, and whip it into shape. Tree canopies, including those in deciduous forests in southern Quebec, are important for many different animals, including insects and spiders. These small, marvelous creatures crawl up and down trees with regularity, feed upon the leaves of trees, feed upon each other, and are food for animals such as birds and bats. Past research has shown that many species of insects and spiders live in tree canopies, and in general, more insects and spiders are found closer to the ground compared to the very tops of the trees. This makes sense, since deciduous tree canopies often need to be recolonized each spring, and tree canopies are relatively harsh environments – they are windy, hot, and often-dry places as compared to the forest floor. What we don’t know, however, is whether the insects and spiders avoid the tree canopies because they may be eaten more frequently in the canopy as compared to the understory. The objective of this research was to test this question directly, and find out whether insects and spiders are arranging themselves, vertically, because predators may be preferentially feeding on them along this vertical gradient. This is a very important area of study since biodiversity is highly valued and important in forests, but we cannot fully appreciate the status of this diversity without discovering what controls it. Our mobile aerial lift platform. TO THE CANOPY! We did this work by using two experiments that involved manipulating different factors so we could get at our question in the most direct way possible. In the first experiment, we made ‘cages’ out of chicken wire and enclosed branches of sugar maple trees in the cages. We did this at the ground level all the way to the tops of trees, using a ‘mobile aerial lift platform’. These cages acted to keep out large predators, such as birds, but allowed insects and spiders to live normally on the vegetation. We counted, identified, and tracked the insects and spiders both within these cages, and in adjacent branches that did not have cages (the ‘control’). By comparing the control to the cage, we could find out whether feeding activity by larger vertebrate predators affected insects and spiders, and whether this differed when comparing the ground to the top of the trees. In the second experiment, we used small pins and attached live mealy worms (larvae of beetles) to the trunks of trees, and we did this in the understory all the way up to the canopy. We watched what happened to these mealy worms, and compared what happened during the day and overnight. This is called a ‘bait trial’, and let us figure out what sort of predators are out there in the environment, and in our case, whether they fed more often in the canopy compared to the ground-level. This second experiment was designed for seeing the effects of insect and spider predators along a vertical gradient whereas the first experiment was focused more on vertebrate predators (e.g., birds). Munch munch. 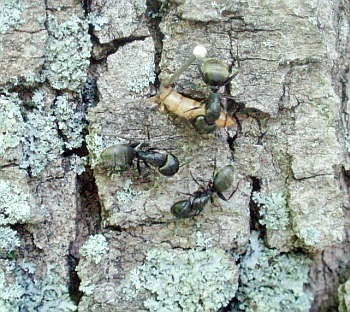 Carpenter ants feeding on mealworms. Our results from the first experiment showed that the cages had an effect: more insects and spiders were found when they were protected from predation by birds. Birds are playing a big role in forest canopies: they are feeding on insects and spiders, and in the absence of vertebrate predators, you might speculate more insects and spiders would occupy trees. Our second experiment showed that ants were important predators along the tree trunks, and overall, the most invertebrate predators were found in the lower canopy. Both experiments, together, confirmed that the understory contained the most insects and spiders, and was also the place with the highest amount of predation pressure. The take-home message is that there is an effect of predation on insects and spiders in deciduous forests, and this effect changes if you are in the understory as compared to the top of the canopy. We also learned and confirmed that insects and spiders remain a key element of a ‘whole tree’ food web that includes vertebrates such as birds, and that predators in trees tend to feed on insects and spiders along a gradient. Where there is more food, there is more predation pressure! Our work was unique and novel because this is the first time a study of predation pressure was done along a vertical gradient in deciduous forests. It will help better guide our understanding of forest biodiversity, and the processes that govern this diversity. A more detailed discussion of this work is posted on the PeerJ blog. Nice summary! I wonder if a long term sampling program would find an association between numbers of visually cryptic species and canopy height. Sean – thanks for the comment. 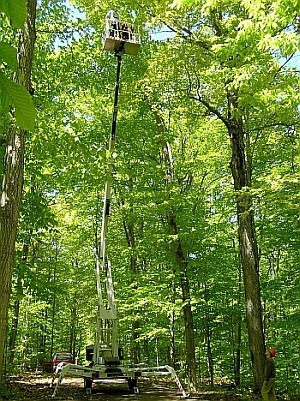 A full season sampling still needs to be done in our canopy system – for so many reasons. I have about a million questions about how and who colonizes the canopy, when. Also, what you point out below – ie., cryptic species in relation to height. And some work on the seasonality of the predator-prey relationships. There are a few PhD projects awaiting!